While an individual with a traumatic brain injury (TBI) may present some unique challenges during evaluation and treatment, the most important point is to ensure that you see your patient as a whole person, not as the TBI diagnosis. Your patient is not the “right hemi in room 301,” or the “guy on Polk Street with aphasia.” You must remember this for all your patients, but because a patient with a significant TBI is often compromised in terms of memory, communication, judgement, and reasoning, what most people think of as the building blocks of personality, of who you are. This can be an especially challenging diagnosis for the patient, the family, and ultimately, the therapist who works to bring wholeness back to this traumatically injured person (Model Systems Knowledge Translation Center [MSKTC], 2016). 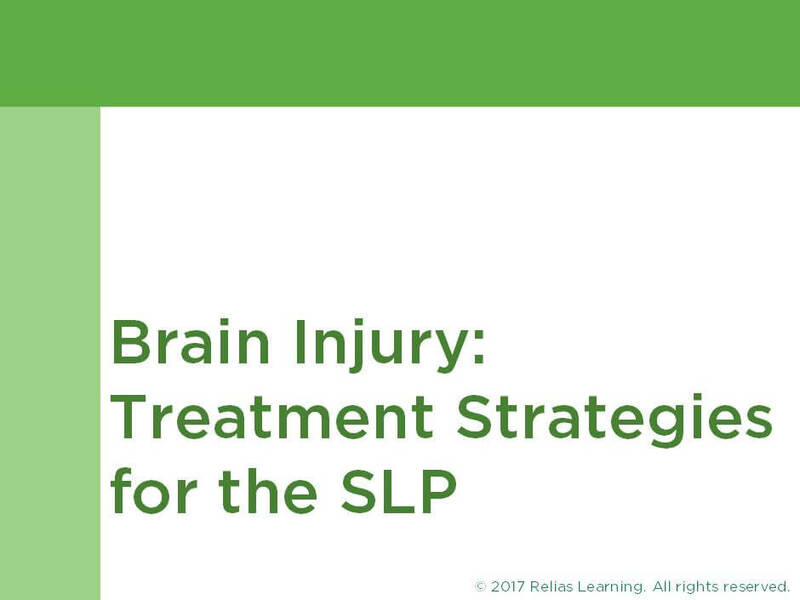 This course will review the four most typical co-morbidities that speech-language pathologists are asked to address, when working with patients with TBI. You will explore the most common deficits and develop ideas for corresponding goals and interventions. Articulate at least two challenges to evaluating a person with a TBI. Discuss at least four treatment interventions for cognitive-linguistic problems associated with TBI. Discuss at least four treatment interventions for aphasia and dysarthria associated with TBI. Discuss at least four treatment interventions for dysphagia associated with TBI. Section 1: Introduction A. About This Course B. Learning Objectives Section 2: Evaluation Basics A. The Assessment B. Rancho Scale C. Four Common Diagnoses D. Cognitive-Linguistic E. Aphasia F. Dysarthria G. Dysphagia H. Review I. Summary Section 3: Cognitive-Linguistic Treatment A. Cognitive-Linguistic Interventions B. First Steps - Response to Stimulation C. Orientation Interventions D. Attention Interventions E. Eye Contact F. Attention to a Task G. Shifting Attention H. Simultaneous and Sustained Attention I. Review J. Summary Section 4: Aphasia and Dysarthria Interventions A. Receptive Aphasia B. Expressive Aphasia C. Dysarthria D. Phonation E. Resonance F. Prosody G. Articulation H. Education I. Review J. Summary Section 5: Dysphagia Interventions A. Dysphagia Management B. Sensory Changes C. Memory Issues D. Attention Deficits E. Mealtime Cognitive Strategies F. Behavioral Concerns G. Review H. Summary Section 6: Conclusion A. Summary B. Course Contributor C. Resources D. References E. Congratulations! Jessica graduated from the Massachusetts General Hospital Institute of Health Professions with a Communication Science degree in 1995. She has more than 20 years of experience in public schools, early intervention, home health, and skilled nursing, serving as a Regional Director for a large, skilled nursing provider. Mrs. McCarthy has provided her expertise to companies during the validation and standardization phase of new language tests, and has performed on-line course reviews on numerous topics. She is the founder of Mosaic Care Management, a company that supports families and caregivers as they go through major medical events or elder care transitions. Her proudest role is that of wife to Tom McCarthy and mother of Caitriona and Michael. Disclosure: Jessica McCarthy, MS, CCC/SLP has declared that no conflict of interest, Relevant Financial Relationship or Relevant Non-Financial Relationship exists. The target audience for this course is: intermediate level Speech and Language Pathologists; in the following settings: Rehabilitation Settings.